While the somewhat nefarious doings of national spy agencies have been much in the news lately, the spy working to gather secret information for his government has long been a favorite topic of writers (and readers of thrillers). One of the great masters of the spy thriller genre is John Le Carré. His somewhat meek, unassuming spy George Smiley was the unlikely hero of several novels spanning height of the cold war between the east and the west. 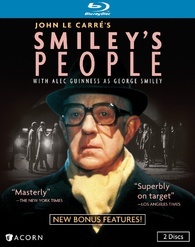 On August 6, a Blu-ray edition of Smiley's People, featuring the bespectacled retired spy, was released by Acorn Media. George Smiley has retired from the service (or the Circus, as those who are current or former employees refer to it), but he has never given up the hunt for his Soviet counterpart, a man known by the codename of Karla. Smiley is drawn back into the world of espionage when one of his old operatives, "Gregory" contacts the agency and asks for an urgent meeting with "Max" -- Smiley's code name. Before Smiley can be contacted, "Gregory" is found murdered in the woods on Hampstead Heath. Smiley is called back by the current crop of intelligence officers to find out more about "Gregory" and what he knew. Smiley is dismayed to learn that things in the spy business have changed a bit since he's been gone. There's now a Steering Committee which stands between the intelligence officers and the government. This committee, called the Wise Men, has to be informed of all activities undertaken by the intelligence service. They are hoping that Smiley can tell them what Gregory (a former Soviet general called Vladimir) knew and if he had passed this knowledge on to others. Smiley finds out that when he attempted to arrange the meeting, Vladimir had mentioned that it concerned the Sandman, the shadowy Soviet spy that Smiley also knows as Karla. Smiley begins his investigation into the death by moving among the Russian expatriate community attempting to re-trace the recent movements of Vladimir and discover what it was he wanted to tell him. In the course of investigating, he comes across a film negative containing some compromising information. This leads Smiley to different European locations as he attempts to track down the elusive Karla. The series was first shown in 1982, so there are no high-tech gadgets. It would be interesting to hear what a young person would think about the equipment shown, such as rotary telephones, "dumb" computer terminals, Polaroid cameras and film negatives. Still, George Smiley is definitely a man who relies on tried and true methods (physically visiting places and questioning people) rather than letting technology do the hard work. It's very interesting to see all the secrecy and heightened tensions that were so apparent during the Cold War. This set also includes deleted scenes from all 6 episodes, production notes, and an insert with a glossary of main characters and terms. There's also an interview with John le Carré from 2002 in which he discusses both his career as a writer and his involvement in the making of this series. He had worked in the foreign service himself, but didn't visit Russia until 1989, during the waning days of the Soviet Union. It was quite interesting to learn that he had intended for the George Smiley character to be central to many books, but after the character became so identified with Alec Guinness, he decided to give Smiley a much shorter career!